Why is it that people assume I will do only nosework and tracking with my blind/deaf dogs? I know these are sports that encourage the dog to rely mostly on his sense of smell. I know that most people think a dog that is blind and deaf must have a superior and heightened sense of smell. But so many people think this must be the extent of what I can do together with my blind/deaf dogs. This has been on my mind lately. People ask me (out of the blue) if I've considered doing nosework or tracking with my dogs. These are great dog sports! In fact, Treasure and I loved and did nosework for many years. But we also did lots of other cool stuff! 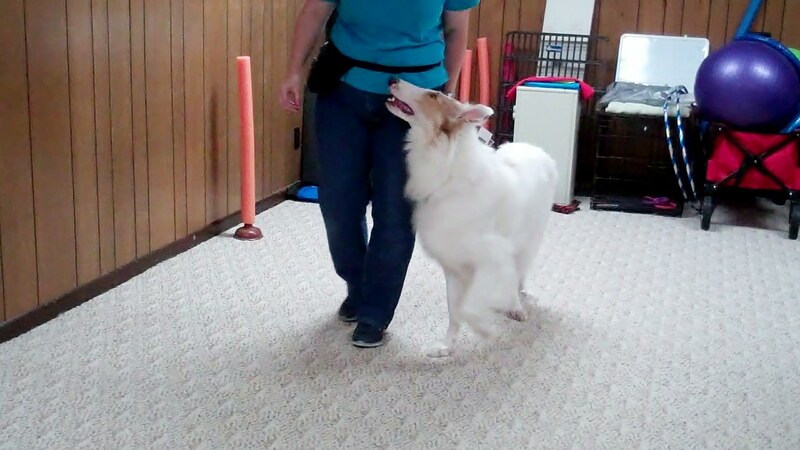 When I adopted Treasure and set out on my training journey with her, there were not many others doing any activities with blind/deaf dogs. Some were just beginning to take some nosework classes. But if I looked online I didn't find any blind/deaf dogs doing much of anything or being taught much of anything. Sure I found deaf dogs, or blind dogs at times, but not those that were both. Why is that? As I was thinking, I realized that humans developed so many dog sports reliant upon our dogs' ability to see. It seems impressive to get our dogs to do all types of activities at a distance or off the ground. There are so many sports, even today, that exclude blind dogs from even participating at all. Even sports that focus on a dog's sense of smell are not always welcoming to blind dogs to give it a go. I did not set out to prove these ideas outdated. 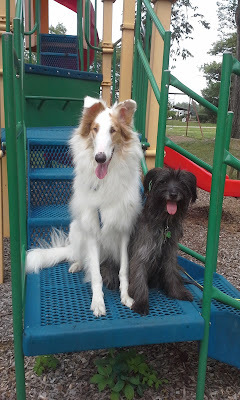 I just set out to teach and have fun with my dogs in various activities. We love the online trick dog titles, as most (but not all) offer a wide variety of tricks to choose from for each level. Even so, many of those tricks seem to be assuming and reliant upon a dog's ability to see. 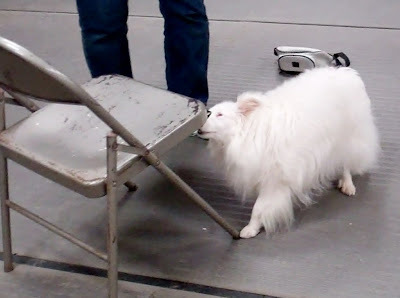 And I've even found some trick dog venues that specifically say that blind dogs can't compete. Which I find rather sad. With my current blind/deaf partner, Vinny, I am pushing the limits of what people think is possible. He is a super willing partner and is showing me, and the world, just what a dog without sight and hearing is capable of. I don't push him, but I do give him the opportunity to learn anything and everything he can, in his own way. He shows me a bigger glimpse into his world with each accomplishment. I think he enjoys figuring out a puzzle for himself as well. Setting out to get his Advanced Trick Dog title, I wondered how a blind/deaf dog could be sent out away from me to a target 10 feet away to do a behavior. So we gave it a try. 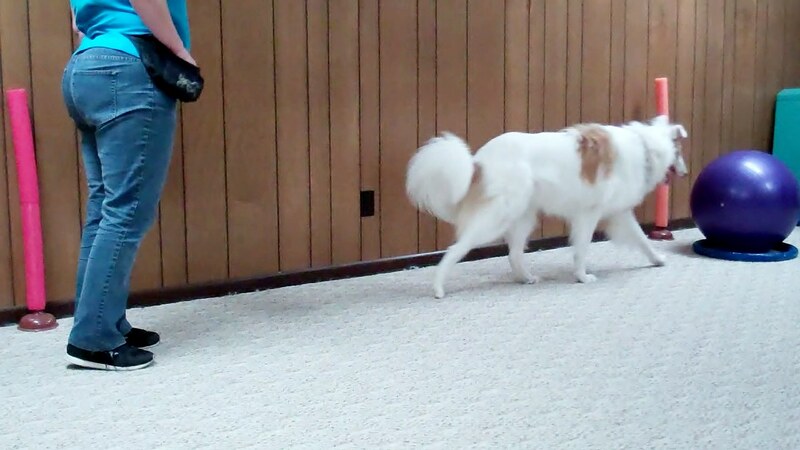 He learned to go out away from me 11 feet on cue, and do several different behaviors! Did he always hit the target directly in a straight line? No, he didn't. But when he realized he was going off course, he could redirect himself, find the target and do his behavior. Vinny - Skateboarding and Other Fun! What does this mean for the future of our training? Wow, I can only imagine the more we practice together, what he will show me! I am so grateful that certain dog sports are open to seeing what all dogs and handlers are capable of. Through them, dogs and handlers that might not have had a chance before are now able to really shine! I hope that more and more dog sports venues will learn to keep an open mind when it comes to how exercises are performed to get to the end result. Keep and eye out for Invincible Vinny and I in the dog sports venues! We are having a blast finishing up our trick dog titles and then going for Trick Dog Champion, and beginning our rally and freestyle training. I hope we have a long and marvelous partnership together. I know I have so much left to learn from him! 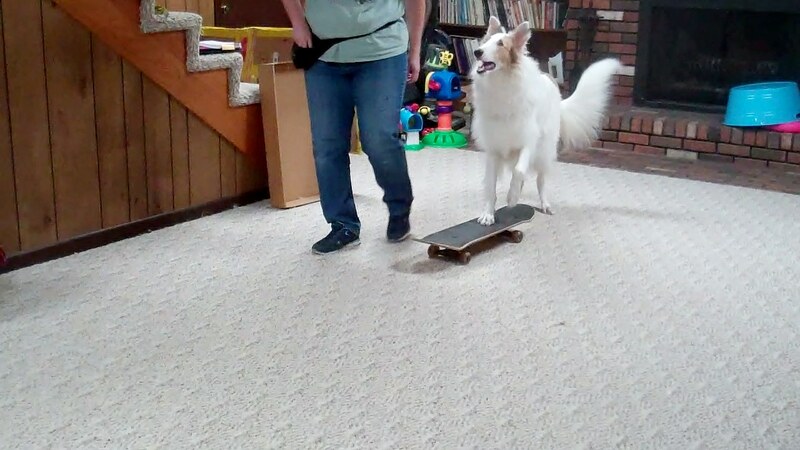 As someone who is working to learn how to partner with my first blind and hearing-impaired dog, it is so helpful and inspiring to see Vinny out there doing it all! We may not accomplish so much, but it is very clear that we have far fewer limitations than I was led to believe at first. Go, Vinny! And thanks, Deb, for sharing the journey! You're very welcome :) I look forward to seeing how far you go together!